Do I Have to Thaw Crab Legs Before I Steam Them? 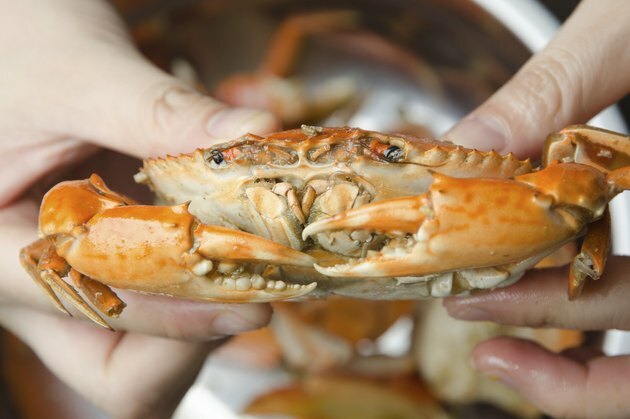 Fresh crabs and other shellfish are among the most perishable of all foods. They die quickly once they've left the water, and spoil just as quickly once they've died. For that reason, crabs are often cooked and blast-frozen on large shipping boats immediately after the catch, in the interest of freshness. Once frozen, crab claws or legs can be shipped around the world with minimal loss of quality. They can be thawed or reheated from frozen. Frozen crab legs are almost invariably precooked. This is partly to preserve the freshest possible flavor, and partly because uncooked crab spoils very quickly once thawed. The important thing to remember when preparing frozen crab legs is that they're already cooked, and if heated too long will become dry and rubbery. There are several ways to heat frozen crab legs effectively. Some simply drop the crab legs into a pot of salted, boiling water and simmer them for five or six minutes. Others prefer to steam the crab legs, cooking them over the boiling water instead of in it. Crab legs can be baked for 10 minutes in a preheated oven at 350 degrees Fahrenheit, in a dish or pan with 1/4 inch of hot water in it. They can even be grilled on your barbecue. Of course, there are times when thawed crab meat is more convenient to use. To thaw your crab legs, leave them in your refrigerator for at least 12 hours or until thawed. This is the safest method, because the crab remains at a safe temperature throughout the thawing process. Failing that, thaw the frozen legs by running cold water over them in a sink or large bowl. That will take one to two hours, depending on the size of the leg. If you're up against a time constraint, use your microwave to thaw the crab legs in small portions. With crab legs, their sweet and delicate flavor is best served by simple preparations. One of the simplest, and one of the best, is to serve the hot crab legs with wedges of lemon and small ramekins of clarified butter. Crab goes well with rice, pasta and Asian noodles. Stir it into a white sauce over fettuccine or a bowl of clear Asian broth with noodles. Crab is also perfectly suited for wrapping with in rice paper with vegetables and noodles to make salad rolls. Can You Cook Shrimp Without Thawing Them?